Henry Stewart or Stuart, Duke of Albany (7 December 1545 – 10 February 1567), styled Lord Darnley before 1565, was king consort of Scotland from 1565 until his murder at Kirk o' Field in 1567. He is usually called Lord Darnley. Darnley was the second son of Matthew Stewart, 4th Earl of Lennox, and his wife, Lady Margaret Douglas. He was their oldest surviving son. Darnley's maternal grandparents were Archibald Douglas, 6th Earl of Angus, and Margaret Tudor, widow of James IV of Scotland. It is the common belief that Henry Stewart was born on 7 December, but this is disputed. 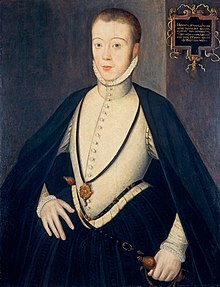 He was a first cousin and the second husband of Mary, Queen of Scots, and was the father of her son James VI of Scotland, who succeeded Elizabeth I of England as James I.
Darnley was found dead outdoors, dressed for bed, after an explosion near his bedroom. Many people thought the Queen had arranged his murder. This page was last changed on 27 June 2016, at 15:56.